Hoe staan de Europese wateren ervoor? Did you read Signals 2018? Please take the feedback survey. Check your knowledge of water in Europe: Take the Quiz! Life under water faces serious threats Life in Europe’s freshwater bodies and regional seas is not doing well. The poor state of ecosystems has a direct impact on many animals and plants living in water, and it affects other species and humans, depending on clean water. The state of Europe’s seas is dire, mainly due to overfishing and climate change, while freshwater bodies suffer from excess nutrients and altered habitats. Chemical pollution negatively impacts both freshwater and marine environments. Close up — Water in the city We often take a reliable supply of clean water for granted. We turn on the tap and clean water comes out, we use it and the ‘dirty’ water goes down the drain. 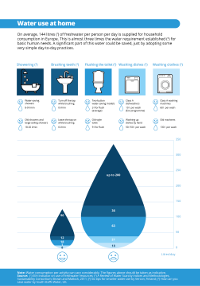 For a large majority of Europeans, the water we use at home is of drinking quality and available 24 hours a day. The brief moment between the tap and the drain is only a very small part of its overall journey. Managing water in a city is not limited to public water systems. Climate change, urban sprawl and alterations to river basins can all lead to more frequent and damaging floods in cities, leaving authorities faced with an ever-growing challenge. Governance — Water on the move Water is in constant motion. Water also facilitates the movement of ships, fish and all other animals and plants living in water. The health of rivers, lakes and oceans has to take into account water’s movements across geopolitical borders. Given this, regional and international cooperation has been deeply embedded in the European Union’s water-related policies since the 1970s. 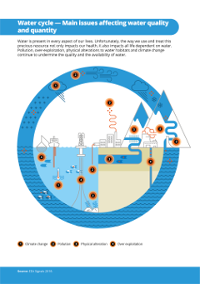 Clean water is life, health, food, leisure, energy… Water covers more than 70 % of Earth’s surface. It was in water that life on Earth started, so it is not surprising that all living things on our blue planet need water. Water is in fact many things: it is a vital need, a home, a local and global resource, a transport corridor and a climate regulator. And, over the last two centuries, it has become the end of the journey for many pollutants released to nature and a newly discovered mine rich in minerals to be exploited. To continue enjoying the benefits of clean water and healthy oceans and rivers, we need to fundamentally change the way we use and treat water. Interview — The Dutch make room for the river Nature and water go hand in hand. This is the thinking behind the Dutch Room for the River programme. This back-to-basics approach now serves as a global model in terms of water management and protection against increased risks of flooding linked to climate change. The most recent extreme floods in 1993 and 1995 served as a wake-up call, according to Willem Jan Goossen from the Dutch Ministry of Infrastructure and Water Management. We asked him what the programme represents in terms of sustainable flood protection. Global and local: secure and affordable energy Energy is a commodity traded in global markets. Lack of access to affordable energy sources, disruptions in energy flows, high import dependency and wild fluctuations in prices are all seen as potential weaknesses, impacting the economy and, consequently, the economic and social wellbeing of the communities affected. Can boosting the renewable energy capacity across Europe and the world change the rules of global energy politics? How does the EU’s Energy Union contribute? Driving to an electric future? A quiet change is under way on European roads. The use of electric vehicles is projected to take off across Europe. It is a move that could help pave the way to a greener road transport system, but one that could pose challenges in meeting energy demand and investing in relevant infrastructure. Interview — Growing food or fuel on our land? Only a decade ago, biofuel production from plants was hailed as an ecological alternative to fossil fuels. Recently, it has come to be seen as competing with food production and not always an effective solution in reducing emissions of greenhouse gases or air pollutants. We talked to Irini Maltsoglou, Natural Resources Officer at the Food and Agriculture Organization of the United Nations (FAO), about biofuel production and agriculture and if and how it can be done sustainably. Energy and climate change Mitigating and adapting to climate change are key challenges of the 21st century. At the core of these challenges is the question of energy — more precisely, our overall energy consumption and our dependence on fossil fuels. To succeed in limiting global warming, the world urgently needs to use energy efficiently while embracing clean energy sources to make things move, heat up and cool down. The European Union policies play an important role in facilitating this energy transition. Energy in Europe — State of play European countries consume less energy compared with 10 years ago, mainly due to energy efficiency gains. Europe also relies less on fossil fuels due to energy savings and the faster-than-expected uptake of renewable energy. In the decade 2005-2015, the share of renewables in the EU’s energy consumption nearly doubled, from 9 % to almost 17 %. Some sectors and countries are leading the way towards clean energy. Despite their declining share of the market, however, fossil fuels continue to be the dominant energy source in Europe. Living in a changing climate Our climate is changing. Warmer temperatures, changes in precipitation levels and patterns, or extreme weather events are already impacting Europe, and these impacts result in real losses. In a series of short articles and interviews, the European Environment Agency’s Signals 2015 presents an overview of what causes climate change and what climate change means for human health, the environment, and the economy. 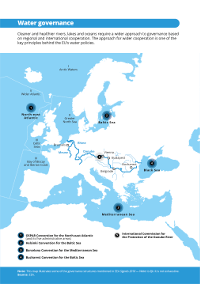 EEA SIGNALS 2018 Water is life Europe's rivers, lakes and seas are under pressure from pollution, over-exploitation and climate change. 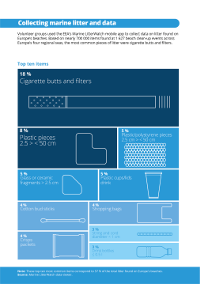 How can we ensure a sustainable use of this vital resource? Signals 2017 - Shaping the future of energy in Europe: Clean, smart and renewable The European Environment Agency (EEA) publishes Signals annually, providing a snapshot of issues of interest to the environmental debate and the wider public. Signals 2017 focuses on energy. For references, please go to https://www.eea.europa.eu/nl/ema-signalen/signalen-2017 or scan the QR code.